What is Dakota Spirit Cheerleading? Dakota Spirit offers a multitude of classes and teams in cheerleading, tumbling and dance. If you’re looking to join a cheerleading team, we have options for every commitment and budget level. At Dakota Spirit, we offer 3 distinct programs so athletes at all different skill and commitment levels can join Dakota Spirit. Our three signature programs are our Developmental, Recreation, and All Star programs. Do you need experience to join a Dakota Spirit team? No, we have a place for everyone at Dakota Spirit! We have three different programs that are tailored to different commitment levels. Do you have to join a team at Dakota Spirit? We offer a variety of tumbling, flexibility, and cheer classes. If you’re not ready for the commitment of a team, we have a place for you in one of our classes. Our 4-week class sessions make our classes convenient to any lifestyle. Additionally, you can drop into any class! What classes are offered at Dakota Spirit? What is the Developmental Leauge? The Developmental League is comprised of teams that focus on teaching the fundamentals of cheerleading. These teams practice once a week for an hour and a half. They perform locally 5-6 times per year and participate in 2 community service events a year. It requires the lowest financial and time commitment, but still gives kids the opportunity to be on a team and perform locally! No tryouts are required for the teams in our Developmental League! What is the Recreation League? The Recreation League practices once a week for 1.5-2 hours. These teams are open to anyone looking to join a cheerleading team. Our recreation teams perform and compete locally and require no previous experience. No tryouts are required for the teams in our Developmental League! What is the All Star Program? Our All Star program is comprised of the athletes who have dedicated to making cheerleading their sport. This program requires the highest commitment level and is geared towards competing from November-April. The All Star Program is the only one that requires tryouts. Tryouts typically take place in late May or June. All athletes on Developmental Teams, Recreation Teams, and All Star Teams must purchase a uniform and hair bow. Recreation Teams are also required to purchase makeup. All Star teams must purchase practice uniform as well. The teams in our Recreational Program travel 1-3 times a year within 75 miles. All Star teams travel about 4 times a year within the region and to 2/3 National Events that require a long bus trip and possibly a flight. What are Dakota Spirit Birthday Parties? Our Birthday Parties are completely customizable to the the birthday boy or girl! We can design the birthday party of your child’s dreams. Typical parties include obstacle courses, trampoline time, and free play! You can bring any type of treat of décor to create a themed birthday party of your choice. To register or sign up for a class or team online, you must first “register” on the website. When you find the class or team to sign up for, just click on the “Sign up Now” button and you will be taken to page where you will create a profile and get signed up. In the future, you can just login and quickly sign up for classes and programs. All class sign-ups or “registrations” take just one click to sign up. During your website registration, you have the option to pay class registration via paypal or Bank Transfer – which means by check. Whatever you choose will be the default payment method for all future registrations for your child. All payments are due the first day of class/practice. I clicked "Register"' for a class, but did not pay through paypal, is my child still signed up? Yes, your child is still registered. Payment will be due by the first day of class/practice. If you clicked “Register” by accident, please email joanna.fritsch@dakotaspirit.com. I have more than one child I want in the same class, how do I register them online? 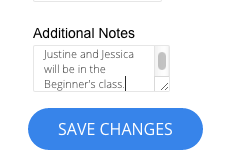 Just click the register button twice and make a note in your account with both children’s names that will be in the class or on the team. You can find Additional Notes under the Profile tab in your account. See screenshot. You can also email joanna.fritsch@dakotaspirit.com. Can I pay tuition through paypal? Currently we only offer online payment for Class and Teams Registration. Do I have to fill out the medical waiver each time I register my child for a class? No, parents are required to read and check the box for the Medical Waiver upon website registration. A hard copy will also be given to you to be signed at the first class/practice. We will keep this on file. How can I finish my registration payment with paypal? If you clicked on Sign Up Now and was taken to paypal, but did not pay immediately, you have 5 days to finish the payment. Click on My Account and click on the Teams/Classes tab. You can then click on Finish Payment and be taken to paypal.